The problem with adoring, reverential portraits of real people is that they tend to lack objectivity and quickly become boring. It’s true of Rang De Basanti director Rakeysh Omprakash Mehra’s Bhaag Milkha Bhaag, an ambitious account of the first 27 years or so of celebrated Indian sprinter Milkha Singh’s roller-coaster life. Over an exhausting 3 hours and 7 minutes, the film, starring Farhan Akhtar as Milkha, details the athlete’s journey from a boy displaced during Partition to his early years in a gang of petty thieves, followed by his recruitment in the Indian army from where he went on to become a sports hero. All this is revealed in a long flashback by Milkha’s earliest coach, Gurudev Singh (an endearing Pawan Malhotra), during a train journey with Pandit Nehru’s advisor, while pointing out why Milkha has turned down the Prime Minister’s invitation to lead a sports delegation to Pakistan. (The explanation for that decision, painfully obvious to anyone with half a brain, is clumsily used as a suspenseful cliffhanger in the film). There are moments of great pathos here, and an inspiring lesson on the importance of perseverance and hard work. But it all moves at a snail’s pace, even as the drama of Milkha’s rise on the race track is punctured routinely by too many songs, overlong romantic tracks, and the kind of ‘commercial-movie trappings’ that are counterproductive to a film of this nature. Biopics, however panoramic in scope, usually boil down to a greatest-hits collection, and Bhaag Milkha Bhaag, for all its sepia-toned flashbacks and terrific training sequences is no exception. It’s a shame Mehra and screenwriter Prasoon Joshi adopt a manipulative, melodramatic approach to highlight Milkha’s achievements and justify his failures. In the film’s opening scene, a key moment in Milkha’s professional career, he loses the lead in the 1960 Rome Olympics when he turns back, apparently because he was haunted by an image from his troubled past. In another scene, where Milkha wins an important race despite being badly injured, Mehra swells the score even as the bandages covering Milkha’s wounds dramatically come off as he inches towards the finish line. And don’t even get me started on the Gadar-esque finale in Pakistan, where Milkha must fulfill the dream of every Indian by beating a rival from our neighboring nation. Never before has slow motion and background music been so abused in a film! Not everything comes apart though. Shankar-Ehsaan-Loy delivers some great tunes, particularly Zinda that is rendered with suitable energy by Siddharth Mahadevan. Mehra himself stages a rousing middle portion in Ladakh, where Milkha trains tirelessly with the India coach following a disappointment at the 1956 Melbourne Olympics. This montage, gorgeously filmed, is a fine reminder of Farhan Akhtar’s complete submission to the part. The actor in fact, and his committed performance, is the film’s biggest strength. From his convincing accent and his dialogue delivery to the sheer beast of his physical presence, Farhan is riveting as Milkha. But Joshi’s script, bursting at its seams with too much information that serves little purpose other than to establish Milkha as someone with a wholesome personality, shortchanges Akhtar with the weight of its mawkish melodrama. Divya Dutta, as Milkha’s doting sister, and the only character in the film who appears to have never aged, hits all the predictable notes. Sonam Kapoor, meanwhile, in a smaller part, as Milkha’s first love, brings a quiet freshness to her scenes. The film itself is well intentioned and shines a light on an important figure. But it’s too long and too unfocused to leave a lasting impression. I’m going with two-and-a-half out of five for Bhaag Milkha Bhaag. Watch it for Farhan Akhtar’s sincere performance. BMB is a brilliant movie. Farhan Akhtar just redefined the cinema with his mindblowing performance. He actually was Milkha Singh rather than Farhan Akhtar. I really don t understand that how can somebody rate it with 2.5 stars. I did not realize that where my three hours were gone. I can even watch it again. Very Disappointed with your review..It is biopic and have to be lengthy check out Hurricane or Pursuit of happiness or even Aviator ….even by Hollywood standards they are long movies..It difficult to convince audience in less than 3 hours about a life which has gone through hardships Please understand it is not masala movie MR CRITIC…And i would suggest you stop writing reviews on Good cinema better you write for movies like house-full and now soon to be released Chennai express they might excite you as quality and hard work of BMB team did not….. GOD BLESS your thinking..
really appalling on your part. First things first, this sports movie will constantly give u a feel of deja-vu of a certain Pan Singh Tomar. Rakeysh Omprakash Mehra is back after Delhi-6 debacle but is not as thumping as his masterpiece RDB. Boasting of brilliant performances by mostly all characters, this biopic becomes myopic with unnecessary love angles, non-required songs and a certain sluggishness. Farhan gives an out of skin performance and virtually looks like the real Flying Sikh. Pavan Malhotra and Divya Dutta are as endearing as the child actor who played young Milkha. Cinematography is realistic. Music is a bit ill-placed with powerful song like ‘Zinda’ not used to its full potential. Sonam and Rebecca just come and go to add glam which wasnt required in an otherwise genuine story. In all, a bit less than my expectations but defintely a one-time watch; all for Akhtar’s hardwork and as a salute to a great sportsperson! This is for all the reviews posted above! Although, I agree with all above that BMB inspite of all its shortcomings, deserve a better rating than 2.5, I am surprised at such harsh comments. I think, the review is wonderfully written by Rajeev. I agree with almost entire review except the last line. Inspite of all its shortcomings, I beleive the movie does leave a lasting impression in my mind. Yes, the movie was too long, editing was poor, lenghty and confusing flashbacks, still- what leaves a lasting impression is an excellent story, outstanding acting by Farhan and excellent direction (each scene looks just so real and perfect). The movie deserves a 3,5!!! 1. Night where child milkha united with his sister. 2. Affair with australian girl. 3. Riot of Paration . These things ccould have been better and this film missed the opportunity to become inspirational film for kids n growing up kids. i don’tthink u need to add sensuality to give a noble message . As a adult i like the film but it is narrowed down the mass appeal subject . yes , the movie can only watched for farhan aktars performance. amovie on mika singh should inspire you and motivate you but the movie fails in doing both . the writer and the producer should have thought that such a movie will be watched by a large number of youngsters and some scenes in the movie are pretty objectionable . The movie was excellent, and despite your review, people will watch it, Farhan would take the national award. The film had to have a Bollywood treatment since last I checked we were in India and not elsewhere ! Masala movies do good here and in Hollywood too. Look at Pacific Rim, which got a 4 star rating from you ! its true in some areas the treatment is melodramatic and informations are over exposed, justifications of failures are immature and too many known faces for the characters ruined the authenticity, like dilip tahil for nehru was nothing but amusing, yet i didnt find it dragging, its below expectation but certainly a must watch. so I disagree with you and your 2.5 just as i disagreed when u gave 4 star for matru ki bijlee ka mandola…. very very disappointed to see the 2.5 stars. maybe you were being a little too harsh. i think the film has been done in a very artistic manner and some people have not appreciated that. its not a documentary nor is it a chronicle. if one expected it to be either then im sure they would have felt disappointed by the film. i was really impressed with the way the film was shot. some scenes were nothing short of magical. Bhaag milkha bhaag its bollywood masterpiece mr masand..ya i knw the movie was too long beacuse of the song and some stupid sense if director cut such sense and make a movie 2.30 hours properly then its totally a osacar winning movie..
Rajeev is right.However the movie is quite enjoyable affair.Go watch it. I agree with your review. As much as I appreciate and commend Farhan Akhtar’s work in the movie, the movie as too long without an eventual plot. The earlier movies of Rakeysh Omprakash Mehra, Rang De Basanti and Delhi 6, were long as well. However these were fictional movies which had enough substance and entertaining factors to ensure that one does not notice the duration of the film, barring Delhi 6 of course; That was atrocious. Bhag Milkha Bhag, being biopic, should have hit the subject head on. Dragging the plot was a desperate attempt to ensure that the views do form a connection with the character’s plight and the character’s resolve, which based on the comments above seemed to have worked :). I would give it 2.5 / 5. Please suggest director required cuts so that this movie will be strong entry for Oscar. Farhan performance was really good. you can imagine what Real Milkha singh did for fitness at that time. Why director wants to waste his effort after doing lots of hard work. There is very fine line between reality and what u can show on real. He missed this opportunity with this movie and with Delhi-6. He stuck this jackpot in RDB. I wish that good sense will prevail with Rakesh. I always like his subject but some where he missing. Please stop criticizing rajeev because is the only critic who is really independent. Keep it up……. BMB is a very nice movie. The movie by Rakesh Om Prakash Mehra (ROPM) is a brilliant execution. 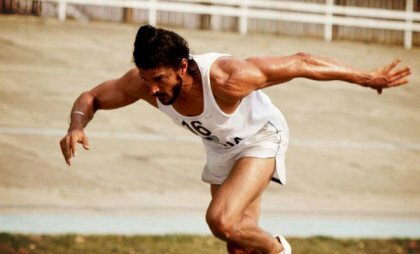 Though Milkha played by Farahan has only one goal in the entire 3hr movie and that is to run to win, it never ever gets boring wow! The credit for this goes to both ROPM and the editing team who have done an excellent job. The background score is pathetic! When milkha runs there is absolutely no music or a titanic kind of music sic!… Rather it should be heart thumping kind of music. At this point I would like to suggest that the Director should use two sets of music directors one for the Background score and the other for the songs; try to bring in specialist for the jobs one could have chosen a new comer as the background music scorer to encourage more talent. Now for the cinematography could have been better; like the flashback of the childhood to be a different shade of Eastman color and the current story to be of a different brighter color so that you can also take the audience visually through the different time zones…. Sonam Kapoor a good decent job. Overall a Great movie! 4.5 out of 5. If you can make this movie to a 1hr 50 minutes then it would definitely have an Oscar entry as the best Foreign Language film! Very Disappointed with 2.5 star. For Fukrey you gave 2.5. It was so horrible to watch that movie for continous 15 mins. Movie deserves above 3 stars atleast. Very accurate review. It was indeed a drag. After the extremely positive reviews in the other websites i couldnot understand if something was wrong with me. Finally someone who shares the same opinion! The film was a drag. At the beginning itself we can understand the entire flashback. But the directors slow narration, was yelling in the mind “we got whaat happened. Get it done with the past”. By the end of the movie i even forgot what happened at the beginning. Though the movie shows hard work and perservance will earn accolades the point was not striking, not inspiring maybe because of the narrative. Yaar. 3 star tho bantha hain. 2.5 is like below average stuff. First time i never felt boring watching a 3 hrs long movie yaar. 2.5 is a bit rude. While we respect the way you review films thoroughly, the rating for BMB seems too low. First because of the guts of the team in choosing a subject that is not conventional. Second because we are in an age where everything done by cricketers is capturing the imagination of the media and public, and here is a team which has done a great job in showcasing the life of a legend in other sport. Third in the times when few movies are inspirational this surely is a tremendously inspirational movie. While movies have to be rated on the technicalities, should the reviews not consider the other elements as well.what ever the rating the movie got, it has gained a wonderful word of mouth and is running to packed houses. Thats an indicator that it is a 5 starer. atleast a 3.5 star movie.. 2.5 too harsh n not fair buddy! There was never a dull moment in BMB. The movie is a fantastic portrayal of India’s revered living legend. Farhan’s acting is simply brilliant. I would give one and a half stars more to what you gave. I would have given it a minimum of 3.5. Its a Biopic and am thankful that Mr.Mehtha did it the way it is ..
“Do not fill your stomach like you will never get to eat again” – a massage from Milkha Singh which left a permanent mark on me and my eating habits, such was an impact of him on me! Regardless to say I went in with lots of excitement, and left the cinema hall with an headache. The movie is just sensationalizing the childhood horrifics of partition times, which was agonizing for entire Sikh community, but is that what this movie was all about? especially in the second half the cut scenes just go on becoming more and more cruel and leaves on feeling lethargic, that too in middle of a race Milkha Singh is just about to win! Few good scenes here and there but overall, despite of sincere attempt, the movie fails to do justice to the Flying Sikh. BMG is Awesome Movie 4 star toh banta hain. Rajeev Masand You were my “pehli pasand” as a film critic. I followed your reviews blindly and found myself absolutely in cognizance and agreement with your opinion after i watched any movie.But this time you really disappointed me after your review of BMB. Your review in this case was highly misleading. I agree that the movie was a bit too long and could have been a bit shorter to make it a gorgeous one. On the other hand, i feel that there was not a single part of the story which could have been deleted… Each part, right from his childhood experiences to what he faced in the military camp and so on enriched the movie and made it an AWE INSPIRING work of art… Also when it comes to acting. Farhan Akhtar, Divya Dutta and Pawan Malhotra have done a tremendous job, which we rarely get to see in movies nowadays. Talking about music, Shankar Ehsaan Loy have given some highly energetic tracks, like Zinda and Maston ka Jhund By showing the finale in Pakistan the film-makers have raised the bar of the movie with scenes where he meets his old friend… They have showcased the emotions of his sister, his friend, his battalion and his coach very well and hence it’s just not a “GADAR-ESQUE FINALE” (as mentioned in your review) .I would like to quote here a very effective and meaningful dialogue from the movie itself “LOG BURE NAHI HOTE HAALAAT BURE HOTE HAIN”. There is a deep meaning and a message for people of India and across the border Here’s a lesson to learn that it’s not hatred that is to be nurtured but a hope to bring back the long lost love between the people of the two countries, Summing up, I will be penalizing half a star from my rating just for the length. You’ve got to be kidding Mr. Masand, 2.5 stars????? What a brilliant movie !!!!! I agree with you Rajeev …the movie is too slow..agreed that the story is quite inspirational but but it could have been put up in a better way….emotions are not depicted up to the mark.! Come on!!! It requires at least 3.5 if not more. I think either you are biased or your kind of cinema no more matches the taste of the audience who have been following your reviews. BMB is a good entertainer and occupies you till the last moment. Not fair rajeev.. Dabang 2 gets 2.5 star and milkha also gets 2.5 stars!!! Not fair. Most of the things said about this film in all the reviews above, good and bad. Although i did not go through each review but most of them seem to be in awe of Frahan akhtars acting, irrespective of what they feel about the film (including rajeev). With my limited knowledge about acting, i can say that farhan only managed to look like milkha and the moment he opened his mouth (to speak or to laugh in typical farhan style) he was just farhan. Did some hard work on his muscles , but still a long long way for him to be a good actor. and I m settling on it just because film was 15 mins more longer than being perfect..
Well.. I loved the movie. But, I also know a lot of people who agree with you on this movie being too slow. While I respect most of your reviews, I have a suggestion for your website. Everyone who comments on your forum should be given a chance to give the movie their own rating and maybe you could show an average rating from all the people who participated in your review. So you’ll have two ratings. Some of us would like to see the public opinion as well and by public, I don’t mean the general masses. But people who follow your reviews and are serious about putting their view in front of others if they don’t agree with you. I want to maybe read a couple of reviews by other people but in one glance, I would like to see if the public agrees with you or not. Maybe you could have a like/dislike option for each user comment. How many people found which comments more relevant and useful and you could put the ones with the most likes on top. This thing works Mr. Masand and I think you should give it a serious thought!! There are a lot of people following your reviews blindly because you are that good. But I firmly believe that we should have transparency into how many people disagree with you on a review, no matter how rarely it may happen. 4 **** stars from me!